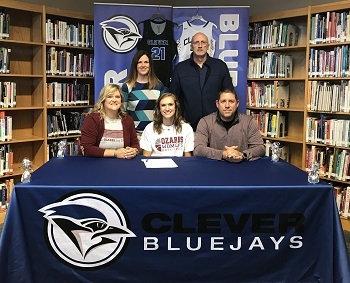 College of the Ozarks Lady Bobcats’ College of the Ozarks Lady Bobcats’ Head Coach Becky Mullis is pleased to announce the signing of Harper Little to the 2019-2020 recruiting class. A 5’6 guard from Clever High School, Little has scored over 1,200 points in three seasons for the Lady Blue Jays. She averaged 17.3 points, 4 rebounds, 5.5 assists, and 5.5 steals per game in her junior season. Harper shot 43% from the field, including 37% from the three-point line. Little was named SWCL Conference Player of the Year as a junior. She is a three-time All-District and three-time All-Conference First Team selection. Little led the Lady Blue Jays to the SWCL Conference Championship a year ago and to the district championship game the past two seasons. Clever also finished in third place in the prestigious Pink and White Holiday Tournament last season. Little is a four-sport athlete, also competing in volleyball, softball, and track. She is the second signee of the Lady Bobcats' freshman class for 2019-2020.